What is the most important element in the design of an ensuite? 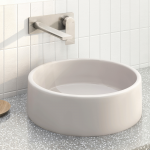 Alisa and Lysandra: Ensuites are the wet spaces that are secondary to the main bathroom. 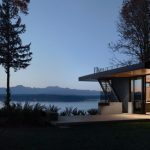 They offer privacy, convenience and the ability for us to retreat in self-care with ultimate peace, away from the main bathroom where all the family action happens. It is important to consider what this space means to you before you start designing. The first question you should ask yourself is: “how will I use it?” Other than the obvious — hygiene — you need to establish the purpose and the vision behind the space before getting stuck into product selection and the nitty-gritty of design and layout. Consider early on what’s at the top of your wish list — visual aesthetics, functionality or storage? 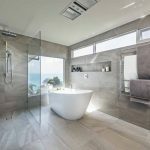 It may well be that all three are important, but understanding what you value most will help you design an ensuite meets your needs. How can you create a sense of luxury in a small space? 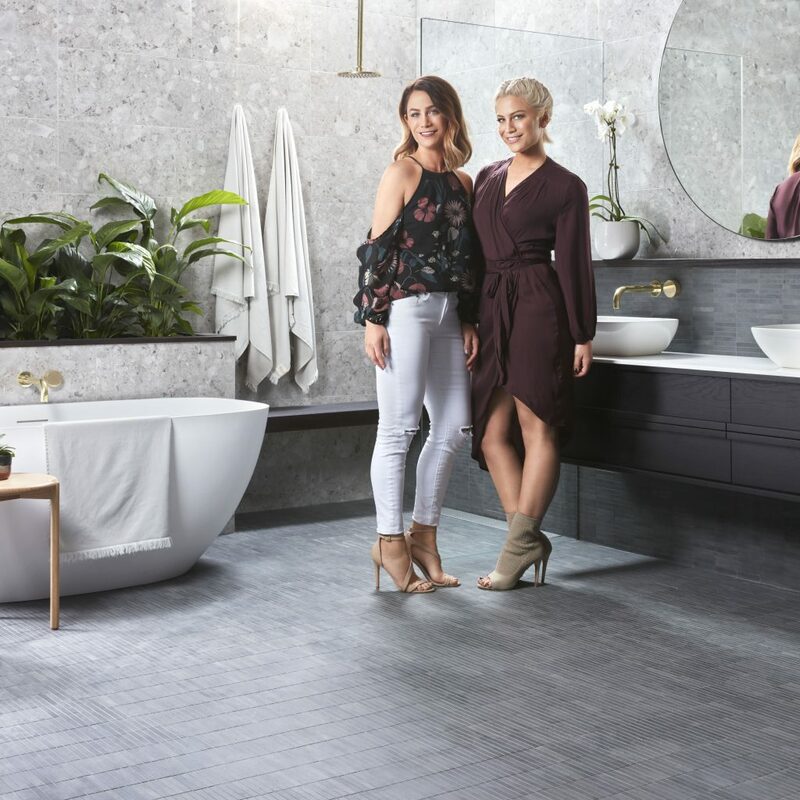 Alisa and Lysandra: You don’t need a spatially abundant ensuite to achieve that ultimate feeling of luxury; in fact, with some designs, less is more. With careful planning and a well-thought-out mood board, you can create opulence by investing in design features guaranteed to impress. 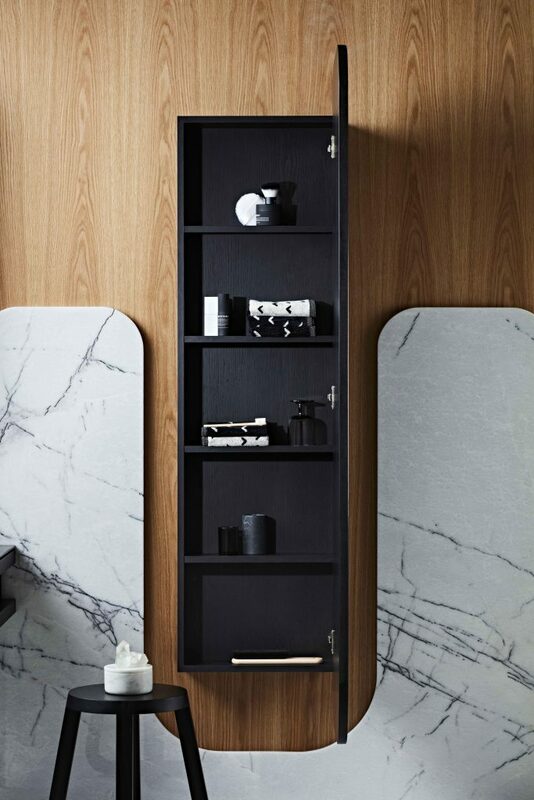 Exercise creativity by selecting statement tiles, unique vanities (such as the ISSY Z8 6 drawer vanity) and other bold fixtures and fittings. Small spaces crave more aesthetic attention to enhance the sense of luxury and diminish the perceived lack of space. In other words, if you want to create luxury in a small space, we give you permission to go ahead and splurge! What’s your ultimate ensuite addition? Alisa and Lysandra: If your space permits, opt for a double shower. It is the ultimate ensuite addition because it saves time and for a minimal additional investment can add to the resale value of your home. Whether you share your ensuite with someone else or enjoy it for yourself, you can’t beat the luxurious feel that a double shower provides. What are your must-have ensuite styling items? 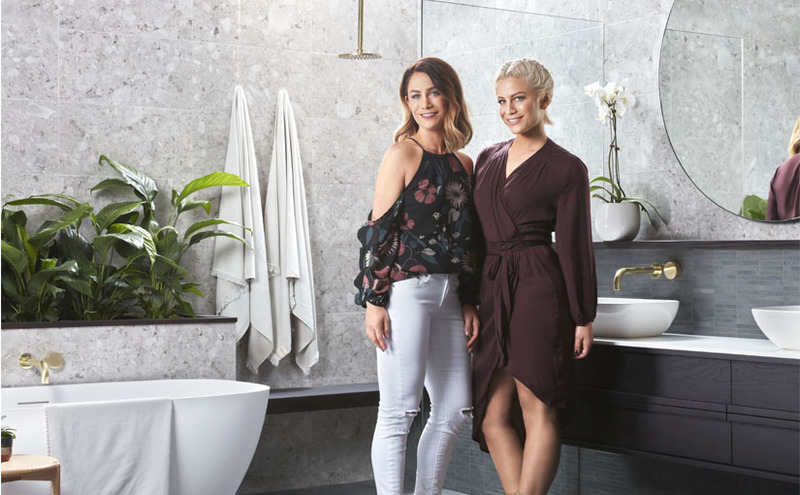 Alisa and Lysandra: Styling adds the finishing touches to any room and for ensuites, we encourage you to invest in items that engage the senses. Look to soy candles with seductive fragrances, rolled-up plush towels within easy reach, green foliage to bring in a hint of nature and accessories such as soap holders (try th e Mizu Drift soap dish), rails and hooks (such as the Milli Glance robe hook) to enhance uniformity and organisation and add a decorative touch — it’s time to go shopping! How can you incorporate extra ensuite storage? Alisa and Lysandra: Rather than using plain mirrors, we love to work with shallow-storage mirror cabinets, which can be custom designed or ready to buy. 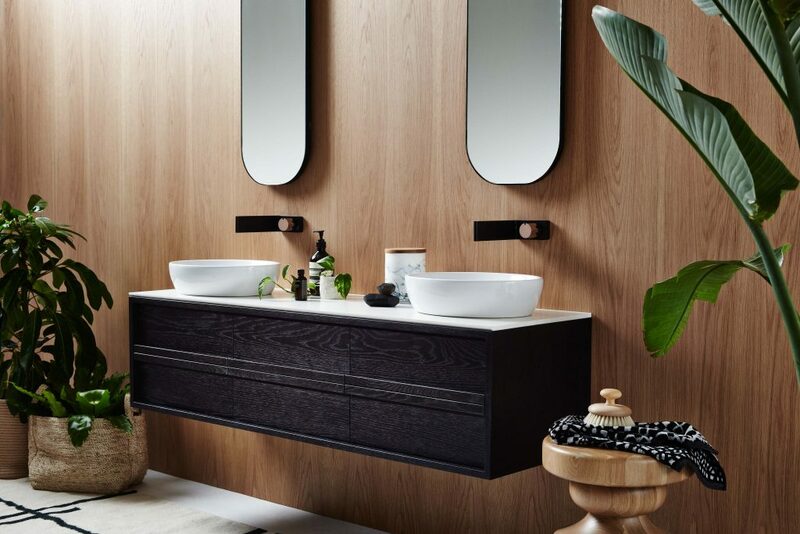 The Issy Z1 recessed oval mirror with shaving cabinet is a contemporary storage solution that keeps vanity countertops seamless and clutter-free. 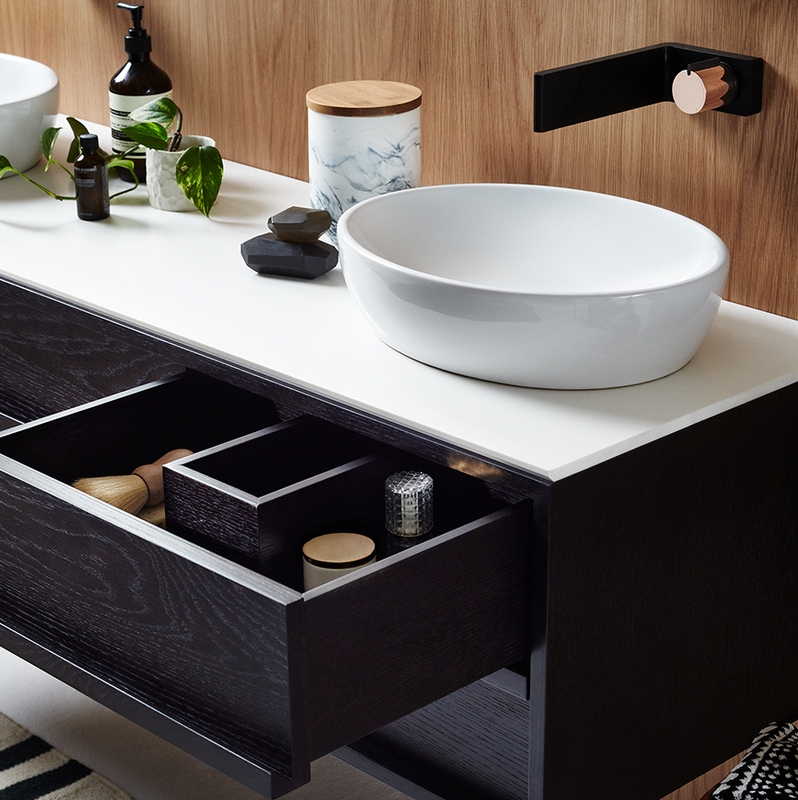 When selecting your vanity, it’s important to remember that deep drawers are not always the most functional. Rather than having three deep drawers, opt for five shallow drawers, which will eliminate mess and keep your personal items visible and within quick reach. Shallow drawers provide space efficiency and help compartmentalise your items with ease. 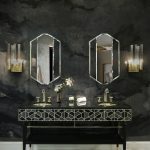 What are some ways to connect your ensuite to the bedroom? 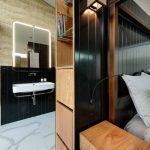 Alisa and Lysandra: Even though, by design, an ensuite may be connected to a bedroom spatially, it can be just as disconnected visually. The best way to create flow is with continuity in colours and styling. 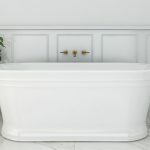 It is also important to keep your materiality consistent — for example, if the bedroom embraces soft, feminine, natural materials, carry that theme through to your ensuite when selecting tiles, cabinetry and fixtures. Also, consider furniture shapes and lighting choices and try to echo those of the bedroom to create a sense of cohesion. 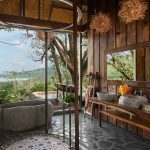 While the rooms don’t have to match each other, as a general guide, remember both spaces are interconnected, just like chapters of a good story!